will be covered. CityEconomist chart based on BLS data. The New York Times this morning has a story by Vivian Yee on the issue of paid sick leave. On Sunday morning, March 24, at 8 am, MSNBC host Chris Hayes is hosting a round table with several Democratic mayoral candidates. Speaker Chris Quinn has a scheduling conflict and can't make the event. But her office has done some good research on paid sick leave issues. The research should be in front of the discussion even if she can't make it. For example, a simulation shows that there is a big drop-off – from 9 percent to 2 percent – in the risk of multiple absences (5 percent of employees or more) with 20 or more employees, assuming five days' sick leave per year. This suggests that the legitimate concerns of small businesses can be addressed by exempting firms with fewer than 20 employees. That would cover 72.7 percent of all NYC employees, based on NY state data on size of establishments, 2011 data. In Connecticut, the cutoff is 50 employees, but this seems unnecessarily high, since it would exclude 56.8 percent of employees assuming the same size distribution of companies. 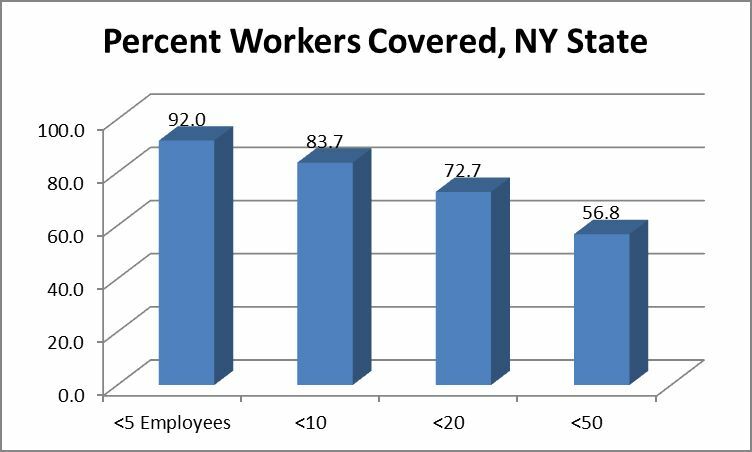 In New Jersey, the percentage of workers covered falls only from 83 percent to 80 percent by reducing coverage from establishments of fewer than 10 employees to firms of fewer than 20 employees, so it has many fewer establishments in the 10-19 employee range than New York State..